It was about this same time in the morning 11 years ago, on a day much like today, that I sat at my computer typing in some blog post - I don't even remember what I was writing about that morning - it doesn't really matter. My neighbor called and told me to turn on the TV. I sat there on my couch not really believing what I was looking at and the tears started pouring down my face. It was unbelievable. To this day it seems so unthinkable that any human being would have whatever it was in their hearts that day to be able to do what they did to other human beings and themselves. My kids were little and didn't really understand everything that happened that day. They still have a hard time wrapping their brains around it. We live over 2000 miles away in a quiet little town where nothing really ever happens and so it is easy to find peaceful moments here. But today is a day to remember. We have been to New York City since 9/11 and love every second of every visit. For my kids it is a treat beyond compare. Out of the quiet little burb that we call home and into the bustling city where there is something going on every minute of the day. For me it is a reminder of everything that is great about America. We have been hit hard. Hit where it hurts. But we have gotten up again and we have risen. Above and beyond where we were before. We still mourn the loss that was suffered that day - I think about those families and how they must ache even still. In the meantime, we live without fear. 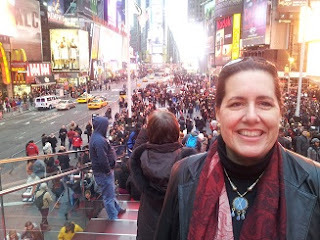 This year my daughter and I had the chance to visit New York City for the Family Travel Conference held at the Omni Hotel sponsored by TravelingMom.com. It was a spectacular event and we had tons of fun. This was one of my favorite pictures from the weekend. 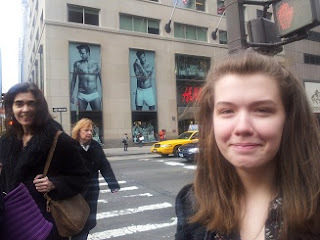 We were walking from the Omni to Virgil's Barbeque where we were having lunch and we saw the big storefront window display at H&M which featured David Beckam in his undies. My daughter said "You have always warned me to watch out what pictures I post online - look you could end up on a billboard". We laughed but then I took the picture. It was a great weekend in a great town. God Bless America. My 9/11/01 started out similarly - I HAPPENED to not be working in NYC that day so I was still in PJs, when my hubs called and told me to turn on the TV. I thought I was watching stuntmen and special effects (lived in LA too long). Then I realized it was real. When I go to NYC now I do think about 9/11 but I don't worry about it. I tend to focus on the heroes and the energy in the City that woudn't give up.